Our alumni, parents, and friends provide essential support for teaching, research, and program needs. The Art, Design & Architecture Museum benefits from annual unrestricted support and major gifts designated for special purposes. Your generosity plays a critical role in our ability to fulfill our mission and is truly appreciated. Every gift counts. Endowment funds - targeted support for prestigious projects and programs, as well as capital improvements to the physical space for the Museum and the architecture collection. Listed below are our highest priorities. 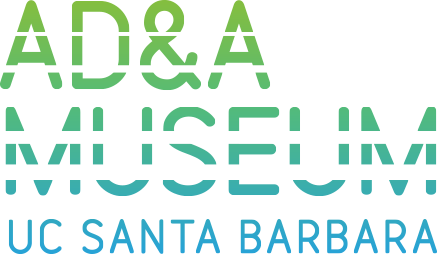 Endowed naming opportunities can associate individuals, corporations and foundations with the Art, Design & Architecture Museum at UC Santa Barbara in perpetuity. Director's Fund - Unrestricted funds that can be used flexibly to support current innovative projects and opportunities that arise within any given year. You may make a current use gift to the Museum online by clicking our Make a Gift button. Each gift to the Art, Design & Architecture Museum can be designed to coincide with the donor's interests, to achieve the donor's vision and goals while meeting the mission and the highest priority needs of the Museum. In making a gift to the Museum, each donor may express his or her wish to designate a gift to any priority area within the Museum. To make your contribution now via our secure online giving website, click the Make a Gift button located here or on the home page. You may make a gift by phone or e-mail. If you're interested in making a major gift or have any questions about the vehicles for involvement, please contact Leslie Gray, (805) 893-4193 or leslie.gray.ucsb.edu We look forward to working with you to meet your philanthropic goals.